Here’s the list of what we’re getting tomorrow. All pickups are October 5th at Sunnyside Community Services from 5-8pm. **Also remember when you pick up you can enter the 50/50 raffle. This benefits our Subsidized Share Program. Basically if you win you get half the raffle cash, and the subsidy gets the other half to help people in our neighborhood access food shares! Arugula – This week is a larger share, so they’re bunched. Store in the fridge. Use now. Green Cabbage – Because these grow so tight, they don’t really need to be washed inside–just peel the leaves until it’s clean. Store in the fridge. Use within a week. Red Tomatoes – These beefsteak variety will be coming to an end soon, savor them! Store on the counter. Use now. 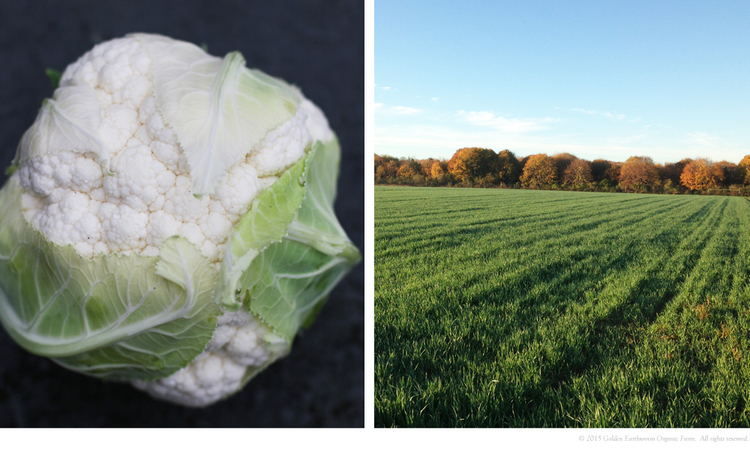 Cauliflower – Did you know cauliflower stays white because their leaves shade them from the sun? Store in the fridge. Use within a week. Broccoli – A sure sign that fall is here! Store in the fridge. Use within 3 days. Red Beets – A yummy earthy treat. You can saute the whole plant. Store in the fridge. Use the greens in 3 days, the root within a week. Mustard Mix – A peppery green to spice up your salad. Store in the fridge. Use within a week. Collards – Best cooked, or used as a wrap. Store in the fridge. Eggplant (in rotation) – Patience is a virtue with these guys–their slow growth means harvesting is in stages and CSA locations will get them in different weeks. Use within a week. Please note that any boxes not picked up by 8pm will be donated to SCS, and items are subject to change. Look for Golden Earthworm Organic Farm CSA on Facebook for more recipes from members!